We often take bookmarks of our favorite websites. If you need uninstall your browser or if you need to format your system, you may want to get a backup of your bookmarks. Here are few steps to make it happen in every browsers. Open Firefox. Go to Bookmarks and choose ‘Organize Bookmarks’. In the Library dialog box choose ‘Import and Backup’ and then click on ‘Backup’. Select the location in which you wish to save your bookmarks. Under JSON extension you can save your bookmarks and restore them when ever you need it. 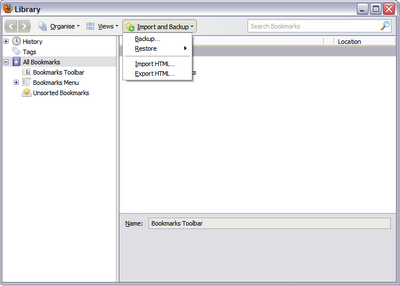 In the same menu if you choose to save under ‘Export HTML’ option, you can retrieve your bookmark in any browsers. Open Internet Explorer. Go to File and choose Import and Export. The Import/Export Wizard will open up. Click Next. Under Choose an action to perform, select Export Favorites. Select which favorites you wish to back up. Click Next. 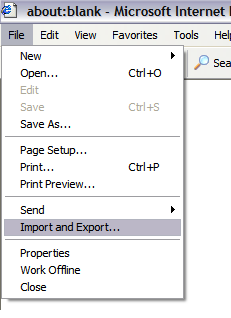 Under Export to a File or Address, select Browse. Select the location in which you wish to save your favorites. Under File name, type a name such as favorites.html. Make sure you save it as an .html file. Right-click the bookmarks bar->Bookmark manager then Tools->Export bookmarks. The Game is over !